The Byram Park Pool is open! The skies cleared just in time this morning for one of the JLG’s most exciting moments! JLG members, town officials, donors, community partners and friends gathered at the entry to the Byram Park Pool for the ribbon cutting ceremony. 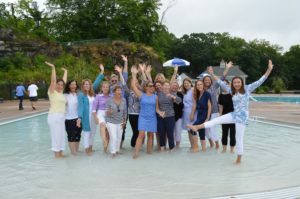 After remarks from First Selectman Peter Tesei and JLG President Elizabeth Peyton, Campaign Co-Chairs Carisa Sykes and Debby Lash cut the ceremonial ribbon, and with that, the Pool was open for business! Read more about it!